I’m Sharla, and I’m here to party! **I’m passionate about people, dogs, wine, cheesecake, anything mint green, bunny hugs, perogies, sunshine, coffee, positivity, and SPIN! 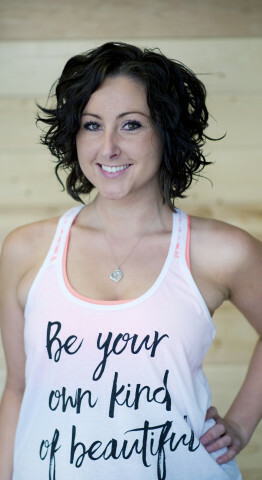 **I choose to RYDE because the moment I bust through those doors, kick off my runners, and hit the bike, I’m doing something important for my own health and for the health of so many others. When I enter the studio my walk turns into a dance. Music is my happy place. I want to throw that bliss back at my ryders and fill them with strength and determination. **If you had told me even a year ago that I’d soon be a spin instructor… I would have paused the episode of “The Mindy Project” I was watching, laughed, and then hit play again. But, the moment I found out about RYDE YXE I knew I had to be a part of the Ryde Tribe. It’s unbelievable the transformation I’ve made, and I love being a part of something undeniably uplifting in our community. Saskatoon is the city to be in, and this place is where I choose to spend so much of my time and energy. I have truly found a life-long passion and a group of amazing instructors and ryders to share it with! **My other job is as a Registered Nurse in Mental Health and Addictions. I spend my weekends checking out live shows, new restaurants, and volunteering for just about anything!